Deciding to invest in a second home might be a great choice for you, but it is still important to think carefully about the decision before you make the purchase. A second home might be a foreign investment for you, a way to diversify assets or a potential retirement home down the line. Whatever the reason, you might gravitate towards the condos available at Grand Baymen on Ambergris Caye, Belize. Here are five of the countless advantages of purchasing a condo at Grand Baymen. Purchasing property overseas can be a big decision not just because of the location, but because it can be tough to know what sort of environment you'll end up with. At Grand Baymen, you can rest assured that you'll be in the heart of a genuine community. Holiday dinners, community events, volunteering in the local area and plenty of socializing mean you'll have countless opportunities to interact with diverse, yet like-minded group of individuals living in Grand Baymen and the surrounding area. Having a condo in Ambergris Caye gives you the best of both worlds. On one hand, you can enjoy a personal retreat in the tropics that can absolutely feel like the home you've always dreamed of. On the other hand, you can pick up and leave whenever you feel like it! Imagine flying in for a long weekend or deciding to jet off to other incredible destinations in Latin America whenever the mood strikes and never worrying about maintenance or checking the mail while you're away. If you think a beachfront condo is the best choice for your desired lifestyle, the toughest part of picking the perfect condo will be seeing what you can realistically afford. A vacation home shouldn't eat up your entire budget, so choosing an affordable destination like Belize is a smart move. Spending time at a condo at Grand Baymen means having access to a more affordable cost of living as well, which helps your everyday spending money go further and allows you to the live the life of luxury you deserve. Have you ever checked into a lavish resort for a vacation and dreamed of staying there forever? At Grand Baymen, that dream can become a reality. 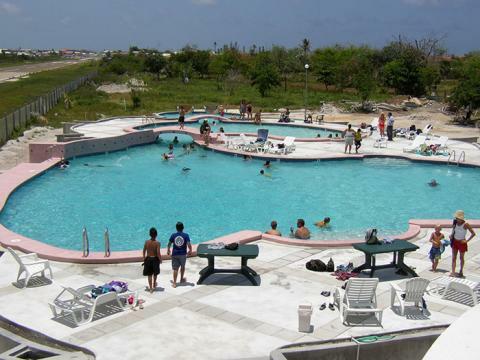 Your condo ownership will allow you to access some of the best amenities in Belize. On any given day at Grand Baymen, you can walk right from your condo to the pier for some fishing, the marina for a boat ride, the fitness center for a yoga class or a swim in the pool or the community's restaurants that serve up incredible cuisine just steps from your home. Let's get real for a moment: finances have a big role to play when buying property overseas. Thankfully, investing in a condo at Grand Baymen is a savvy move. If you're not planning to spend a lot of time there, simply rent it out as a vacation residence and enjoy the revenue it produces. You can use the home in the future, or you can sell it for a profit as the market rises in Belize. With so many advantages, it's clear to see the appeal of owning a condo at Grand Baymen and having the best of Ambergris Caye, Belize, right at your fingertips.